This FBR fund has 0.25% 12b1 fee but it doesn’t have any sales load. The fund’s expense ratio is 1.51% per year. It also has a yield of 0.29% per year. The fund has been managed by David Ellison since 1996. As mentioned, this FBR fund is classified as financial sector equity mutual fund. 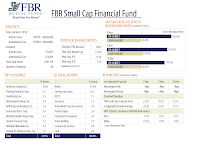 The benchmark of this FBR Small Cap Financial Fund is NASDAQ Bank Index and Russell 2000 Index. Morningstar has rated 5-star rating for FBRSX fund. Based on load adjusted return, this fund has returned 1.12% over the past year and 8.57% over the past ten years. The fund has its best performance year in 1997 with 58.36%. Its worst performance return occurred in 2007 with -22.18%. This fund has 0.71% of 5-year average return. Investor will need $2,000 minimum balance for your regular brokerage account and $1,000 for retirement account (IRA) investment for investing in this FBR fund. This fund is available to many investors. Investors can purchase this fund through 84 brokerages, such as JP Morgan, T Rowe Price, Schwab Retail and Institutional, Dreyfus NTF, DATALynx, Td Ameritrade, Inc, Pershing Fund Center, Vanguard NTF, etc. 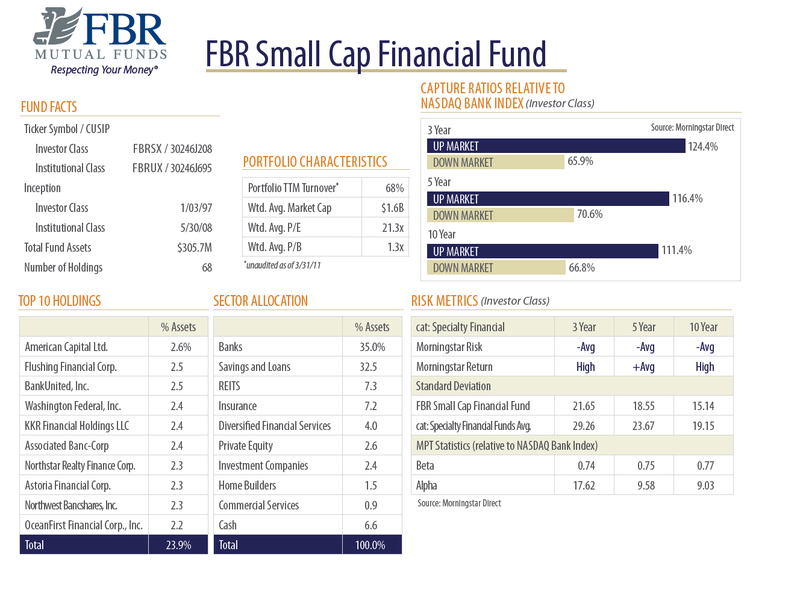 The other class of this fund is Institutional Class (FBRUX). This fund has a total of 68 holdings as of March 2011. The top ten holdings of this fund represent 23.9% of the total holdings. They are American Capital Ltd, Flushing Financial Corp., Bank United Inc, Washington Federal Inc, KKR Financial Holdings LLC, Associated Banc-Corp, Northstar Realty Finance Corp, Astoria Financial Corp, Northwest Bancshares Inc and OceanFirst Financial Corp Inc. As of July 2011, the top 10 sectors of this fund are Savings and Loans (33.1%), Banks (31.1%), Cash (9.8%), REITS (9.1%), Diversified Financial Services (5.4%), Insurance (4.3%), Investment companies (2.4%), private equity (2.2%), home builders (1.4%), and Commercial services (1.2%). Investment risks include market risks, equity investments risk, temporary defensive positions, small cap investments, foreign investment risk, and non diversification risk.